Let's get food out of the way first. Steak and baked potatoes for dinner on Saturday, Lynne's chili with homemade cornbread on Sunday. Yum to both! 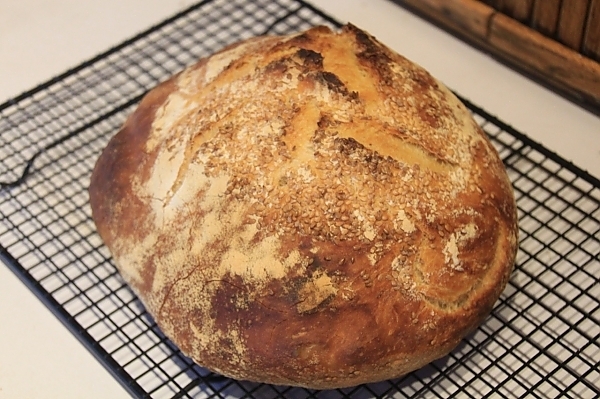 I also baked a loaf of bread on Sunday because I need bread and bread crumbs for the Italian meatloaf later in the week. We'll eat it up for breakfasts, I'm sure. Lynne made a peach cobbler recipe that called for self-rising flour. We learned that Bisquick is probably not the same thing -- at least at this altitude. Leftover sliced steak on salad with home made blue cheese dressing for lunch on Monday. I'm writing this early afternoon on Monday. We arrived exactly one week ago. Yesterday (Sunday) was a cool and rainy afternoon. Not typical of Colorado, we had a full day of clouds and light rain. According to my little weather station, we got about 1/2" of rain. It was wonderful. Everything smells so good and the moisture is very welcome. 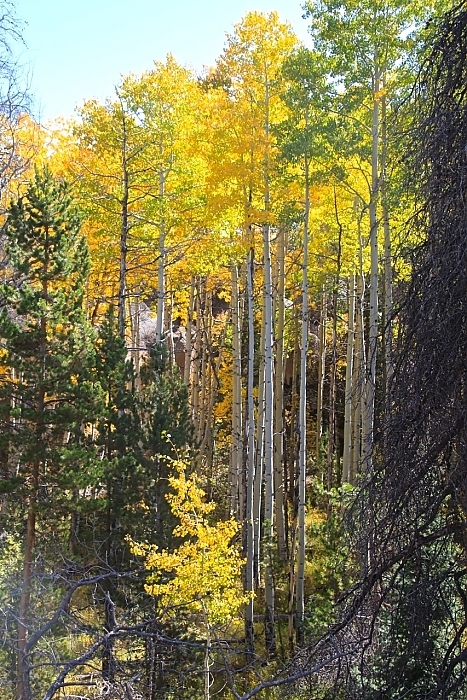 It will help the trees get stronger and better fight off disease and critters. 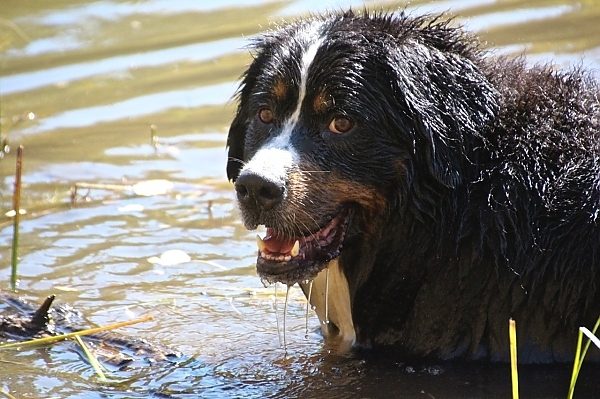 In fact, in the morning we walked down to the beaver pond to give Bella a chance to swim, and I have never seen the pond so full this time of year. The lumber jacks were supposed to come today and do the "clean up" of the meadow. However, they were short a person and for safety reasons, did not come. Probably best anyway because of the heavy downpour we had mid-day. It really came down for a few minutes -- cold, wind and wet. We even fired up the stove for a while to stave off the cold and humidity. But, it was a more typical Colorado rainstorm and passed quickly and the sun is now out. The loggers will try again tomorrow. I got a couple of chores done today. I changed the oil in the generator. For the record, it has 77.6 hours on the meter, now. I also took down some "shelves" that I had put up on the porch years ago. They were staggered in a way that made them a great cat tree -- and they were for the cats. But eBay doesn't care, so I took them down. This is a popular Brazilian drink. For one person, cut a washed lime in half aroud its orbit, then slice that into 4 or 5 slices. Put lime in the bottom of a one-serving cocktail shaker. Add two teaspoons of granulated sugar (or use simple syrup, for some dilution). Muddle gently to release the lime juice and dissolve the sugar. Add two shots (2 ounces) of cachaça -- the Brazilian rum that is the heart of this drink. Add 5 or 6 ice cubes, then shake well. Serve with the ice in a glass. I use Leblon cachaça, and it needs only a little sugar. Other brands like Pita, I've found need a bit more sugar. Experiment. Don't drink too many in the process. The pool isn't open yet, but we had a nice day by going to the Warwick market, having lunch at the vineyard, driving Mia, and then hanging out at home. We sat out by the pool and had a Mojito. In a cocktail shaker, gently muddle a few fresh mint leaves. Add 3/4 shot of simple syrup, 3/4 shot of lime juice, 1-1/2 shot of white rum. Add 6 ice cubes and shake well. Pour, unstrained into a highball glass. Add club soda to taste, about 3/4 to 1 ounce, stir once and serve garnished with a fresh mint leaf. 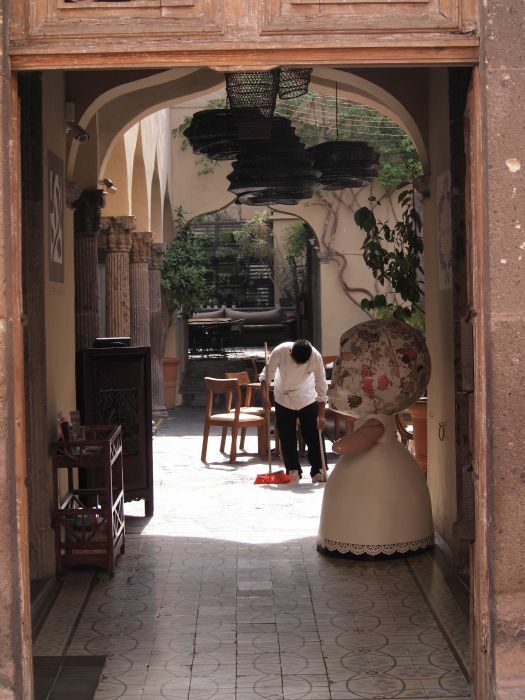 We arrived in SMA (the local shorthand for San Miguel de Allende) on Saturday. We had an uneventful trip from Newark, NJ to Houston, TX and then on to the Leon/Guanajuato airport. Then, it is a 1-1/2 hour drive to San MIguel. A driver was waiting for us and after a short delay to report Lynne's bag was missing (okay, it was not completely uneventful), we rode through a rain storm to get here. Great, a rain storm. I thought we'd left those behind in New Jersey. After a briefing from the land agent and maid, we unpacked. Well, Lynne didn't...but Mom and I did. We got a call that Lynne's bag arrived on a subsequent flight and would be delivered between 9:00 and 9:30. I guess there had not been room for the bag on our flight (pretty small plane). Since we needed to be home for the delivery, we knew we should eat somewhere close and quick. 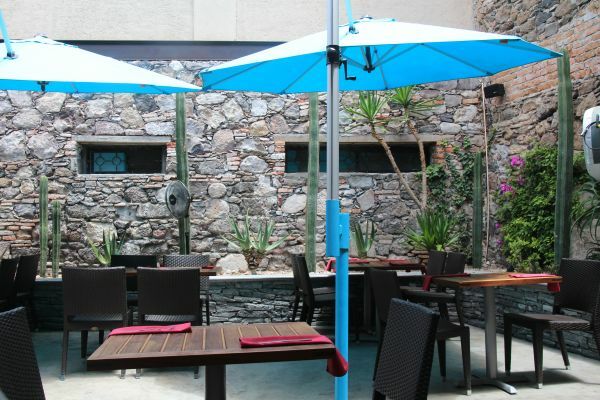 The closest restaurant is called The Restaurant at Sollana 16 -- just up the street from us. So, that is where we went. 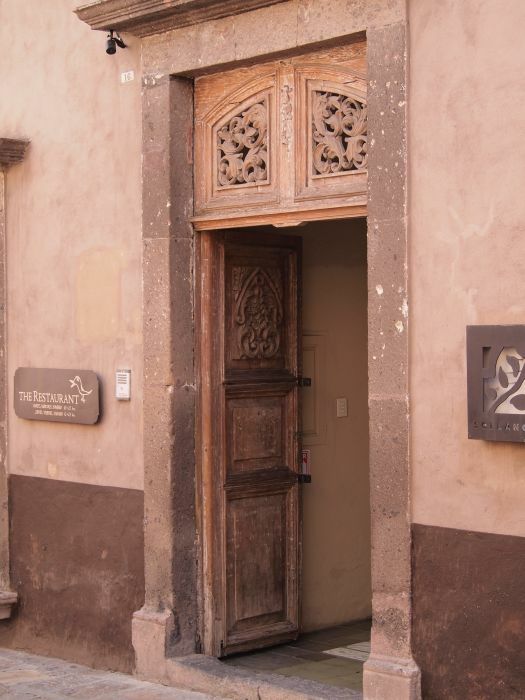 The entry door to The Restaurant. Like most colonial buildings, the entrance gives no clue as to what lies inside. I ordered an appetizer of grilled calamari in a spicy sun-dried-tomato and preserved lemon sauce with capers. We split that. Delicious. For main courses, my mother had seared Pacific salmon with a Moroccan barbeque sauce with vegetable couscous; Lynne had grilled scallops and shrimp with asparagus, zucchini, sweet corn and heirloom tomato jalapeño relish. I had roasted breast of chicken with oven dried tomato, preserved lemon, parsely, kalamata olives and garlic confit. We split a nice bottle of red wine. The food was awesome, the service impeccable. A bit expensive, I think we spent about $240 for the three of us before we were done. 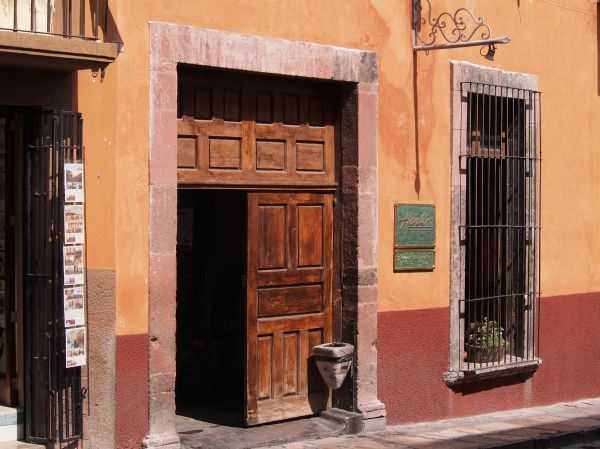 But, well worth a visit if you are ever in San Miguel. After dinner we walked around a bit because we had some time to spare. The bag arrived at 9:30 sharp. We ate breakfast at a cafe on the Jardin. Lynne had eggs with ham and Mom and I had huevos rancheros. We did not have any lunch, but nibbled on some Doritos and cookies instead. So, dinner was early--around 6:30. We went to Hank's New Orleans Cafe & Oyster Bar. We had eaten there the last time we visited many years ago. We each had an appetizer since we were hungry. Lynne had octopus carpacio which was very good. My mom had a shrimp cocktail which was cooked shrimp served in a slightly spicy tomato sauce. And, I had the same thing only with a mixture of shrimp, octopus and oysters. For main dishes, Lynne had a grilled skirt steak with guacomole and beans. Mom had pasta putinesca. And, I had blackened redfish. To be honest, even though this is one of the top rated restaurants in the city, it was not great. Lynne's steak was gray and mushy instead of nicely browned on the outside with a medium rare interior. The sauces for both the appetizer and my main dish had been thickened, perhaps with arrow root or corn starch, giving them a glistening color and strange gooey consistency. The flavors were good, but not great. I'd say this was the least favorite of the restaurants we tried. We walked home--taking a few long-cuts--then later Lynne and I walked back down to the Jardin and had a nightcap of whiskey roja. It was great to sit and watch people in the town square socialize. Kids were playing. A mariache band was playing. Church bells rang. Very relaxing and fun. Juanita, the maid in the house we have rented, make us huevos rancheros for breakfast along with fresh fruit and freshly squeezed orange juice. She comes to work at 9:30, so it was about 10:00 before we ate. Our strategy was to have a big breakfast and then snack for lunch, just like yesterday. Tonight, Polla Feliz takeout at home, but more on that later. I did have a cactus filled gordito mid-afternoon for lunch. I broke a wine glass. I'm sure it would be covered by the damage deposit, but I felt so bad that we decided to replace it. So, in the early evening we took a taxi to the Mega--the local mega-market that rivals a WalMart super center, only maybe better. There, we stocked up on wine, got some nice pastries to have with fresh strawberries that Mom bought at the local town market, got some cheese and chorizo for lunch tomorrow, and 4 new wine glasses. Should work...replacing one broken one with four new ones. Across the street is Pollo Feliz. They do chicken right. It is rotisseried over a charcoal fire. But, first the chicken is marinated in and/or rubbed with a wonderful spice blend. They don't get a lot of tourists there, so Lynne and I struggled some. Ordering the chicken went well: an "entire" chicken. But, we got stumped by the assortment of side dishes. The waitress finally decided for us and gave us some of everything: salad of lettuce, tomato, carrot and cucumber; grilled jalapeño peppers; corn chips and salsa; and, corn tortillas. Wow, the peppers were hot. It was a delicious meal eaten "at home" and it was nice to spend the evening at home. We watched the sunset from the roof deck, then had fresh strawberries with a variety of pastries. Now, that's life. Chilaquiles for breakfast along with fresh fruit and freshly squeezed orange juice for breakfast. As promised, bread and several cheeses (blue, jalapeño, and goat) along with chorizo slices for a mid-afternoon snack after walking the city some more. Not having any problems with the 10,000 step program on this vacation. 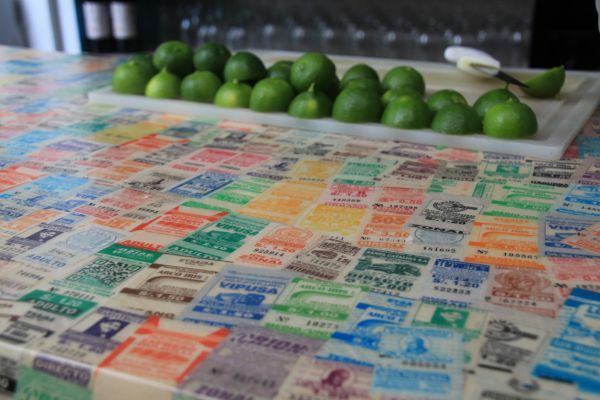 Afternoon marguaritas at the roof top tapas bar at the Rosewood Hotel. It is called "Luna". From there you can see the entire city. Must be fantastic at night. By the way, a piece of advice. The first day you are here, buy the local newspaper "Atención". You can get it for 15 pesos anywhere papers are sold, including the Jardin. It is a combo English/Spanish newspaper with all the daily activities listed. It has great editorials tailored for the tourist and expatriot, and can fill you in on all the art, music, food, museums, etc. as well as the local festivals and other events. Get one. 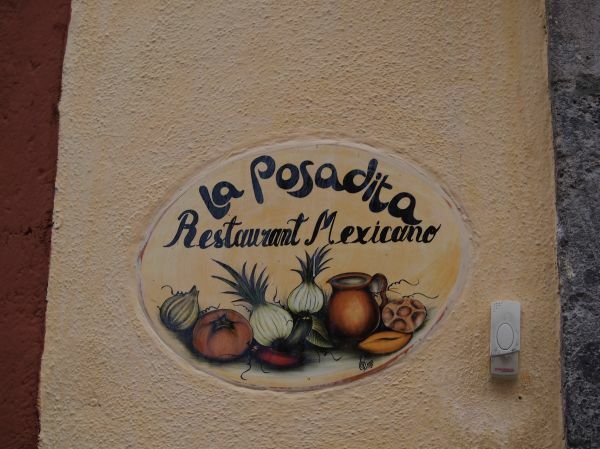 Dinner was at La Posadita, a very short walk from "home". We did not realize that, so took a taxi. He looked at us like we were crazy, and even tried to talk us out of taking us (I think), but we paid him $3.00 to take us about a block. La Posadita is a touristy place. It is a popular recommendation for tourists first night in town because: 1) it forces you to find the Jardin and Perroquia; 2) the views are great and you can see a lot of the town and get a reference; 3) the food is pretty darned good. 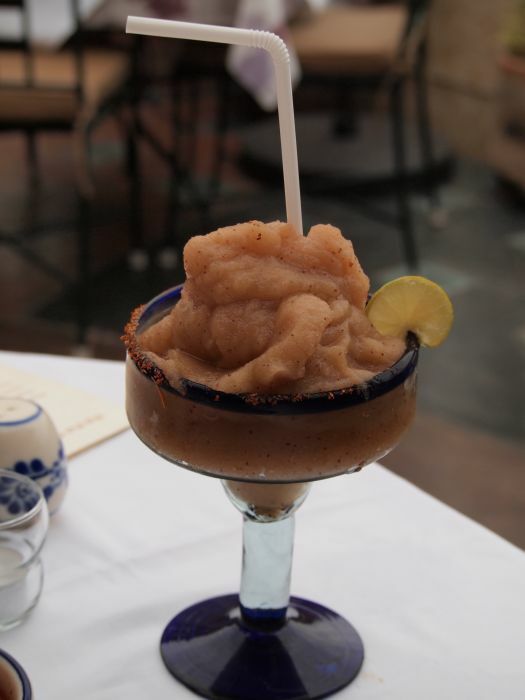 We started with their famous Tamarind Margauritas. They are served frozen and slowly melt in the glass providing meal-long refreshment. Lynne had green enchiladas with chicken. The green sauce was tomatillos, chiles and lime juice. Mom had grilled chicken fajitas. I had Cochinita Pibil, a slow-cooked pork dish with onions, achiote, chiles, orange juice and other goodies, usually cooked in banana leaves. I've made it at home but never had a flavor reference. I do now! Just spoon some into a corn tortilla along with picked onions and maybe a bit of habañero chile, if you dare. For dessert we had some pecan pie and chocolate cake with coffee. Wednesday was moving day. We had to move from the posh place we've been staying. We are moving to the house we had originally booked for this vacation. But, it sold before we came and the new owners were here planning rennovations and remodeling. (The realtor put us up in his own home instead.) We had wonderful scrambled eggs with salsa along with fruit and freshly squeezed orange juice for breakfast. Then, we packed for the 1 block move. We walked a bit for exercise, but around noon moved to the new house. I'm sure we looked funny dragging our suitcases over the cobblestone streets. It was like a parade, Juanita, Hugo, Mom, Lynne, me and the real estate agent each carrying or pulling something. Before leaving we had to say goodbye to Skipper. See Lynne's blog for details. We just snacked on cheese and bread for lunch. Dinner was at a Peruvian restaurant called La Parada. We had Pisco Sours while we perused the menu. Lynne settled on Ceviche Levanta Muertos which is a ceviche of octopus, shrimp and white fish with mango, corn and sweet potatoes. Mom had chicken livers stir fried with soy sauce and chile paste with a side salad and fried potato chips. I had a rice dish--Arroz Afrodisiaco--I liked the sound of that! It was ancho chile and tomato jasmine rice with a variety of seafood. All was delicious and we may return tomorrow for lunch (small plates). It is Thursday, 1 May. Labor Day in Mexico. We had breakfast at a restaurant in one of the hotels close by. I had huevos rancheros, Mom had pancakes, and Lynne had poached eggs on toast. We are not sure what to expect on Labor Day and we don't have any special objectives for the day. So, we'll see what comes. (I guess I am settling into the Mexican way of life). 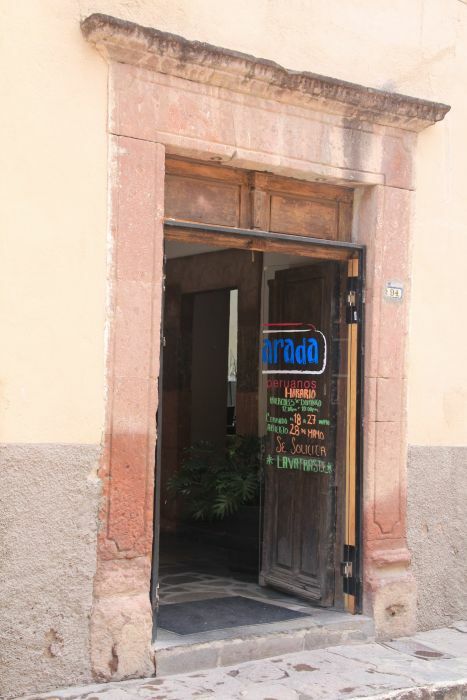 Lunch was back at La Parada (named for a bus stop in Lima, Peru). I'm not sure we set out for there, but it was on our photo-taking path, so we went in for some "small plates". Not only is this our favorite restaurant of this stay, but it is also very economical. We had bottled water, a couple of glasses of wine, three "small plates" and one normal plate (all shared) for about $45 including tip! I had Muchame de Pulpo which is a ceviche of tomato, octopus, avocado and a garlic vinegrette. It was about 4 nice bites. Lynne had Tiradito Ponja which is a ceviche of thinly sliced fish, mirin, soy sauce reduction, avocado and sesame seeds. Mom had Ceviche Patria which is a ceviche of white fish, corn, onions, glazed sweet potato. 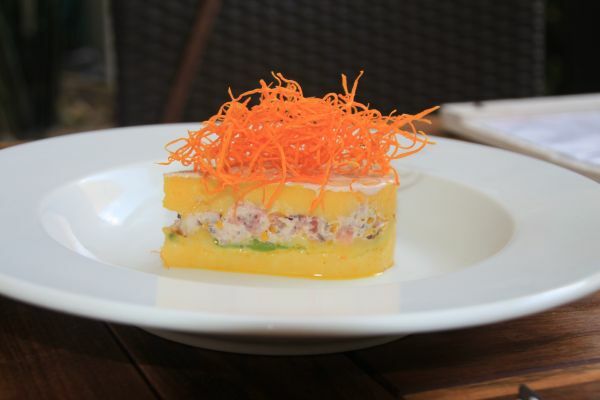 Then, we all split the Causa de Pulpo al Olivo - Cold Ají Amarillo and Lime Mashed Potato Filled with Octopus, Peruvian Black Olive Mayonnaise and Sliced Avocado. Absolutely delicious and beautiful, too! It seems like all we did was eat, sleep and walk this trip. But, we saw great sights, got good exercise and ate great food!